Project CARS has undergone some big changes over the past couple of years. The high-fidelity racing sim from Need for Speed: Shift developer Slightly Mad Studios looked " gorgeous " from the moment it came off the line, but as the new side-by-side comparison trailer shows, it's come a long way since. 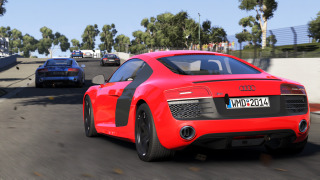 The July 2012 state of Project CARS looks good. In fact, I'd probably have said it looks very good, if I'd seen it entirely on its own and without a virtually identical video from earlier this week playing right beside it. But running next to gameplay from August 2014, it looks almost primitive, doesn't it? The game was running at "ultra" graphics settings for the video, powered by a 4.4GHZ Intel Core i7-4790K, 16GB of RAM and an EVGA GeForce GTX 780 SC ACX with 3GB of DDR5. I don't know what comes after "gorgeous," but whatever it is, this is it. Project CARS is expected to be ready for release in 2015.